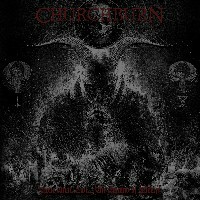 Born out of the collaboration between two underground veterans Dave Suzuki (most known for his guitar and drum work with VITAL REMAINS) and Ray McCaffrey (ex-SIN OF ANGELS and GRIEF), CHURCHBURN is a devastatingly haunting death sludge band from Providence, RI. The two embarked on a journey with the intent to deliver the world deeply sinister riffage, releasing their first full length in 2014, "The Awaiting Coffins," a bloodsoaked burrow into the caverns of death and doom metal. Soon reworking their lineup in 2017 with Timmy St. Amour (ex-HOWL) and Derek Moniz (ex-HEADROT), the fourpiece release their sophomore LP titled "None Shall Live… The Hymns of Misery." The blistering quartet wastes no time bringing on the misery, as the opening track "Vexare" proves to be the sludgiest song on the album, slowly beating the listener down into submission with a painfully tormenting riff. "Lines of Red" keeps things sluggish for a minute only to bring on the hypnotizing riffage we come to expect of the man behind some of the most catchy riffs VITAL REMAINS has to offer. The raspy, torturous screams of Suzuki, coupled with his impressive solowork perfectly match the tone of the many grooves found in this nine minute chamber of suffering. Starting briefly with a clean guitar tone, "Misery Hymns" is one of the many songs that prove CHURCHBURN excels at intertwining melodic passages and leads with terrifyingly heavy and cathartic riffage that bleeds pure dread. "Before the Inferno" is where the death metal influence rears it's satisfyingly evil head, with sinister, dissonant riffs throughout – the war drumming of Derek Moniz, making the various transitions seamless. "Relieved by Burning Lead" is a slow building, slow burning lamentation that carefully pushes the knife deeper into the listener with melancholic release. The closer starts briefly with acoustic guitar, soon ending the album in the stirringly evocative way it began, focusing hard on the sludge, the guitar layering creating the perfect tone to leave the listeners with samples of screams. CHURCHBURN is an extremely important group (bordering a supergroup) that has this reviewer wondering how they are not blowing up right now. Their ability to weave together thick and crunching doom/sludge with diabolical death metal riffs that are at times blackened is something every fan of doom should be paying attention to.